Johnnie Walker, the world’s No.1 Scotch Whisky, today opens its first flagship experiential retail store in Madrid. The exciting new space, which promises to become a leading destination for Scotch lovers and whisky novices alike, plays host to a wide variety of immersive experiences, including whisky appreciation classes and tastings designed to help people explore the world of Johnnie Walker and Scotch. 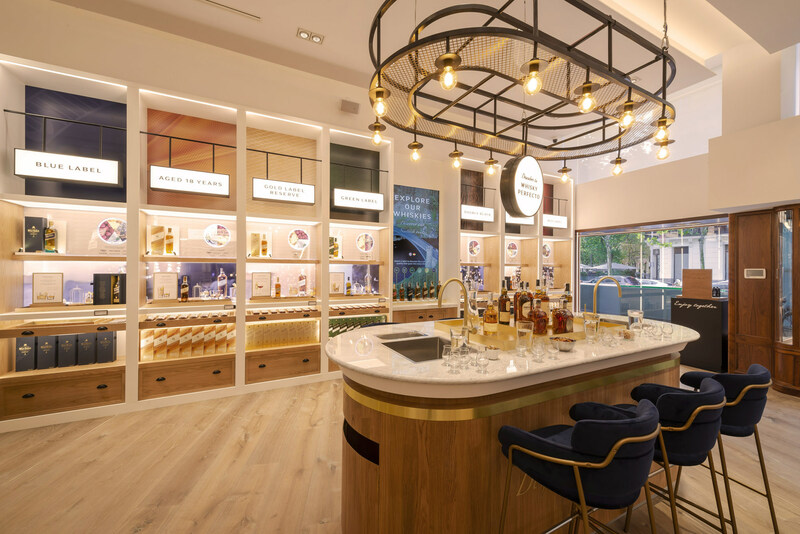 Visitors will be able to choose from a special collection of Johnnie Walker whiskies, purchase some of the rarest and most exceptional single malts from which Johnnie Walker is crafted and explore limited edition curated collaborations exclusive to the new store. Among the experiences on offer is an interactive hosting area where guests can discover the craft of cocktail making, a tasting table where they can deep dive into the flavours that lie at the heart of Johnnie Walker and a personalisation station where people can find unique gifts and add bespoke engravings and labels to purchases. The cutting-edge store offers virtual experiences such as Discover Scotland through Johnnie Walkerallowing visitors to discover Johnnie Walker by taking a tour to the four corners of Scotland, discovering the breathtaking Highlands, the intrigue of the Islands, the lush Lowlands and the secrets of Speyside, culminating in a taste of Johnnie Walker. There will also be seasonal offerings, with a Johnnie Walker cocktail-expert in-store this festive season to demonstrate how you can impress guests with a pairing of frozen Johnnie Walker Gold Label Reserve and a taste of hand-made, award-winning Scottish chocolate as well as show the cocktails and techniques that will turn your party drinks into showstoppers. The launch of the new retail experience follows the announcement of a £150 million investment in Scotch whisky tourism by Diageo throughout Scotland – including plans for the opening of a new state-of-the-art Johnnie Walker visitor experience in Edinburgh, as part of the biggest concerted programme ever seen in Scotland’s whisky tourism sector and is the latest announcement from Johnnie Walker as the brand prepares to celebrate its 200th anniversary year in 2020. Thank you for reading my articles and engaging with the hand picked PICANTE News! Here are a few things you should know about me! After accumulating enough experience by launching and building a successful media and events organizer company in the gaming industry, the opportunity to also move into more verticals just came naturally. I've started writting in 2009 and thanks to my webdesigner skills, managed to develop some recognized review portals in several industries. In 2015, I have moved deeper into journalism and media by co-founding a B2B publishing and events organizing company which we run in parallel with PICANTE New. My experience has lead me to move into the B2B sector and write about compliance updates and report around the happenings of the online and land based gaming sector. I have hunger for knowledge and always curious about what happens in tech and this is one of the reasons I've started writing and publishing news about several industries, such as AI, VR / AR, Blockhchain, Fintech. Came to realize there are many new things that are often overlooked in the busy media streams, thus would like to bring you some news about some of the newest releases and happenings. BLOCKCHAIN, VIRTUAL REALITY (VR), AUGMENTED REALITY (AR), BANKING/FINANCIAL SERVICES, BLOCKCHAIN, COMPUTER ELECTRONICS, INNOVATIVE SOLUTIONS, ARTIFICIAL INTELLIGENCE, ADVERTISING, TRADE SHOW NEWS, and many more. Let's also connect via social media! You can find me on LinkedIn. RVshare, the world’s largest RV rental marketplace, has launched in-depth guides to all 60 of the United States’ National Parks. According to RVshare customer data, more than half of RV renters are headed to national parks. In response, RVshare’s team of travel experts created these guides to serve as an easy-to-use online resource to navigate the ins and outs of national parks. They provide valuable tips in one place, including the best hiking trails, nearby towns and entertainment, where to camp, and more. Explore the guides at www.rvshare.com/national-parks. According to the National Park Service, an estimated 331 million people visited National Parks in the U.S. in 2017. With 60 parks spanning across the country, adventure-seekers in every region have access to explore at least one of the scenic, preserved lands. In addition to popular destinations like the Grand Canyon, the RVshare National Park guides spotlight lesser-known parks, such as Wind Cave in South Dakota, and the remote North Cascades in Washington. With the guides, RVshare’s goal is to highlight the breathtaking views, incredible wildlife and endless adventure of the parks and encourage travelers to explore the beautiful escapes in an unparalleled experience, quite different than staying at a hotel and driving in for the day. In addition to being immersed in nature and having immediate access to campfires and beautiful trails, RVs offer the added benefit of bringing more family members and pets along. Other features to enhance the experience include RV delivery options in select cities, roadside assistance and 24/7 customer service and insurance. 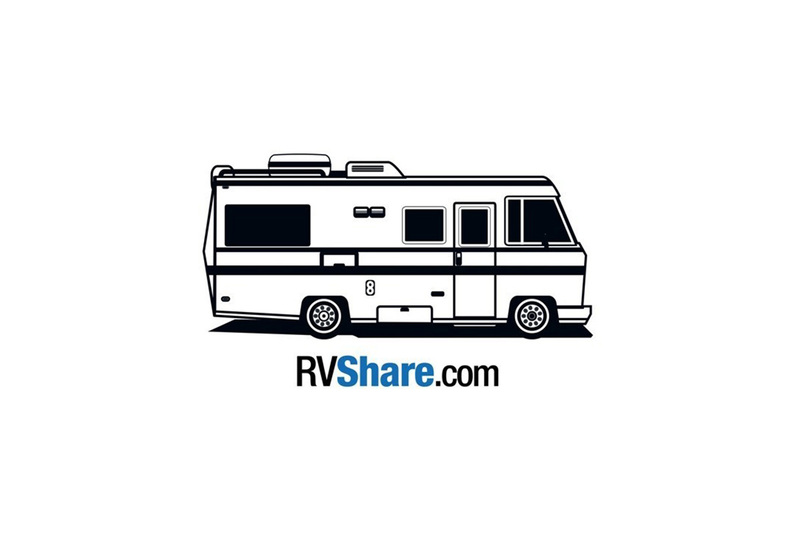 For additional information and to book your next rental, visit rvshare.com. 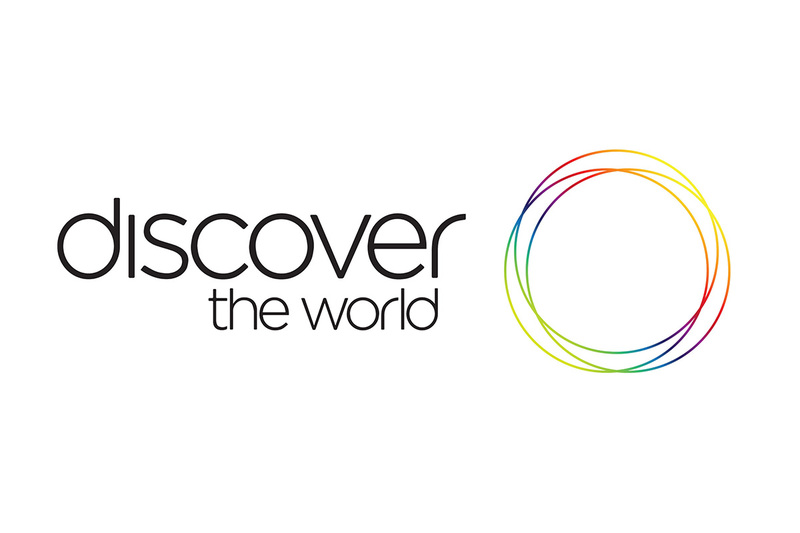 Discover the World, a leader in global sales, marketing and distribution, has opened a new Middle East office in Dubai this month. Lakshmi Durai, the new Discover the World Director in Dubai, has more than 30 years of travel experience in the Middle East region. In her career, Durai has represented Royal Caribbean’s three brands, established her own sales and marketing company Travel Matrix in 2015 and successfully launched a cruise platform called CRUISEXPLORE, promoting more than 15 cruise brands across the region. Corendon founder Atilay Uslu had booked a room in the hotel. Exactly on the spot where – if everything went well – the nose of the Boeing would be placed in front of the window. “When I opened the curtains this morning, I saw her in full glory. I realized that after months of preparation we really succeeded in getting the plane to its final place with a lot of fitting and measuring. That kind of takes your breath away,” he says. The transport of the aircraft this weekend coincided with the celebration of the first test flight of the Boeing 747 on February 9th, 1969, exactly fifty years ago. The 747 is an iconic plane and was the largest aircraft in the world until 2007. It could transport 2.5 times more passengers than other conventional types. It was also the first wide body aircraft, with two aisles. Characteristic is also the upper deck, where the cockpit is located. KLM introduced the first Boeing 747 in its fleet in 1971. The ‘City of Bangkok’, which was added to the fleet in 1989, was then baptized by nine Thai monks. 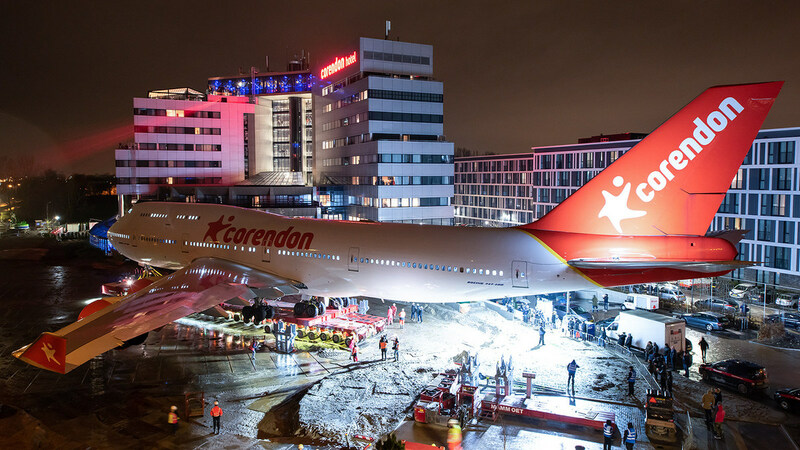 After almost thirty years of loyal service, the repainted aircraft now decorates the Corendon hotel garden.